Here I would like to show you two images of potato starch grains taken with different optical contrasting methods. The top image was taken in dark field, the bottom one in bright field. 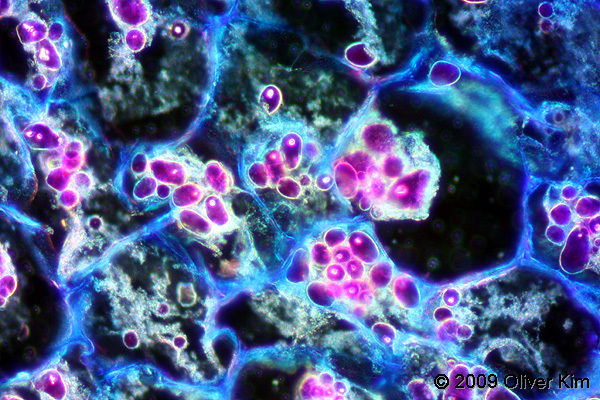 The purple or red structures are the starch grains of the potato (Solanum tuberosum). This is a nice example on how the addition of a simple field-stop filter can result in drastically different images. The contrast of the images was adjusted and both images were sharpened slightly. Image stacking was not necessary. The starch grains of potatoes are also called amyloplasts, they are found inside the cells of the potato tuber. Starch is a polysaccaride, made of long chains of glucose molecules. The glucose was originally produced by the leaves of the potato plant. Starch can be present in the form of either amylose or amylopectin. It is not water soluble and therefore suitable for storage. The slides werw obviously peviously stained but what with? I have seen blue stach with iodine of course but the first picture is said to be dark ground. The bright field the grains are red which seems toindicate you used something other than iodine or that perhaps the grains were degraded by heat or partial enzyme action, but they seem to be quit intact. Sowhat’s the secret? The first picture now has been replaced with the correct one. I accidentally included a brightfield image when updating the site. About the staining, I have to admit that I do not know the secret, because (I confess…. ), I used a commercial slide. They evidently also microtomed the potato, and did not scratch off a potato sample, as commonly done. Not sure of the prep of the bright field image. 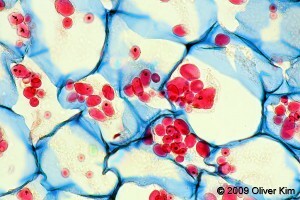 However, in a neutral pH both cellulose and alpha-amlylase (from starch) will stain red with water-soluble congo red. Clearly, a second dye was used for the cell walls.